New version of InputStick firmware (v0.98) is now available. 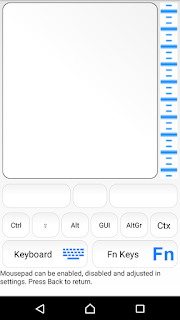 You can flash new firmware via Bluetooth as soon as your InputStickUtility gets updated. InputStickUtility > Select device > (More) > Firmware upgrade. Please read carefully and follow instructions! If update fails or gets stuck, go back and try again. If your device is NOT password protected, firmware update can be started ONLY during first 30 seconds after plugging it into USB port. When USB host issues SetIdle request, USB_SUCCESS is returned. This change makes InputStick compatible with latest OS X 10.11 (El Captain). PIN is now set to "1234" (BT2.1 version) or disabled (BT4.0 version), password protection is removed, all settings are restored to default values. 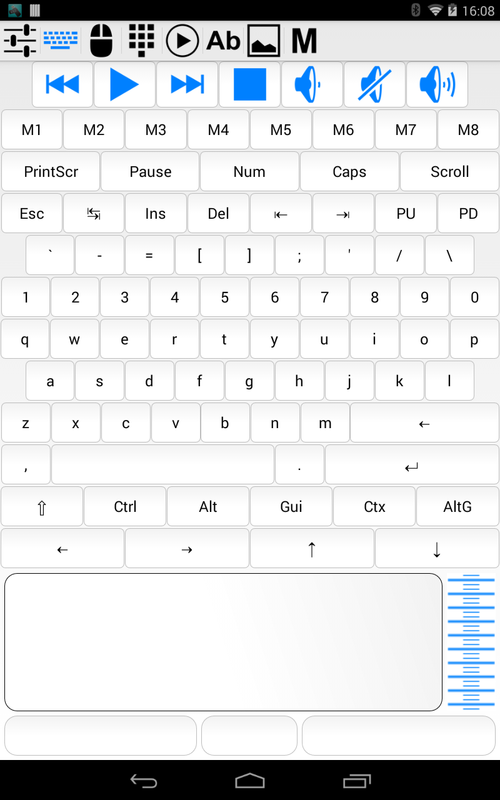 (*) OS X and Linux, keeps state of keyboard LEDs separate for each keyboard. 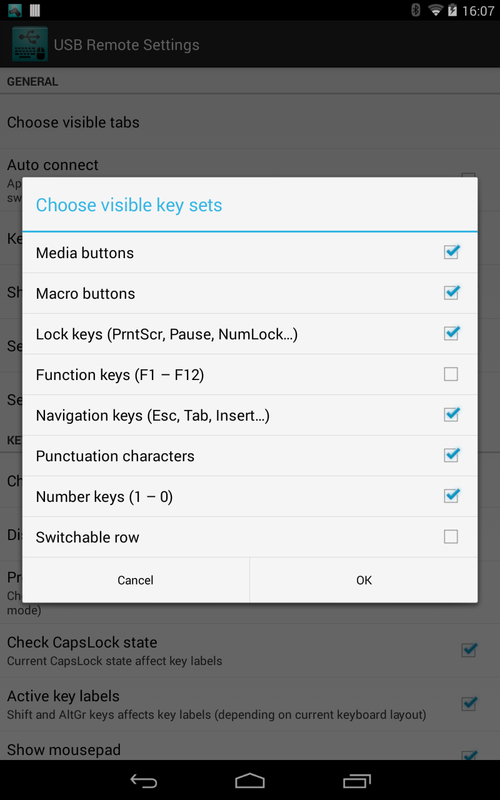 InputStick will not be able to detect if CapsLock key was pressed using other keyboard. Restoring defaults requires physical access to InputStick device and USB port. 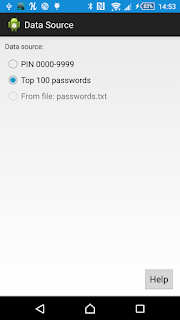 It is not possible to remotely remove password protection! 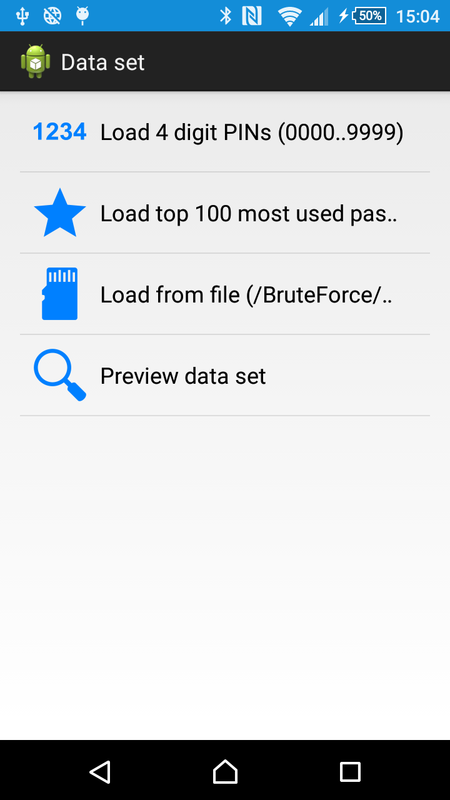 If password protection is removed without your knowledge, you will be notified about this fact by InputStickUtility app during next connection attempt. With previous firmware version (0.97), this method allowed to restore pairing PIN ONLY. 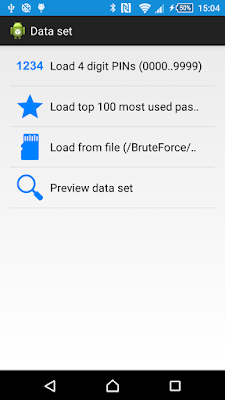 Removing password protection required to go through more complex procedure (requires using InputStickUtility application and takes approximately 10 minutes). 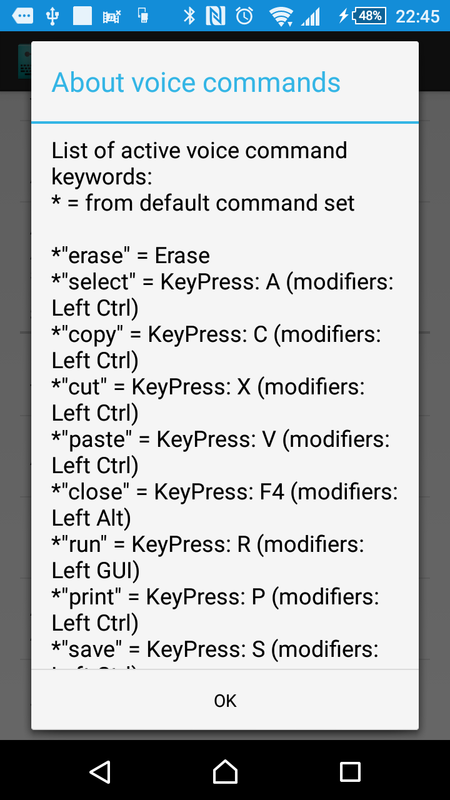 See: InputStickUtility > Select device > Configuration > Connect > Restore defaults. 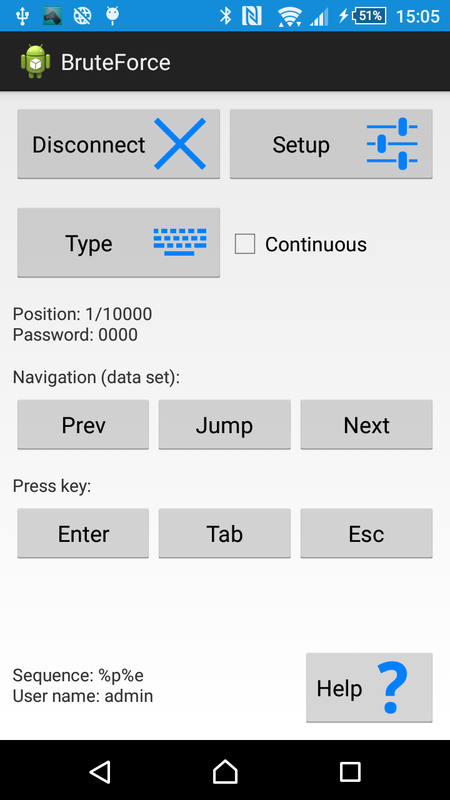 InputStickUtility > Select device > Configuration > Connect > Password protection > Restore options. solved potential problems that could occur if uptime exceeds approx. 50 days. It is now possible to send multiple reports of different kinds within a single packet. It is also possible to send duplicated packets, just in case first one is not correctly delivered. 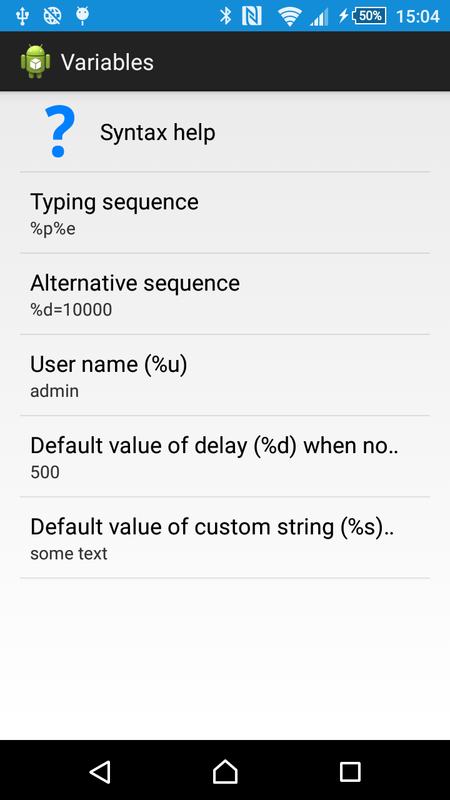 This will allow to solve (with new version of InputStickAPI for Android) problems related to Android OS Bluetooth stack, which under some conditions, fails to correctly deliver packets when Bluetooth Low Energy mode is used. 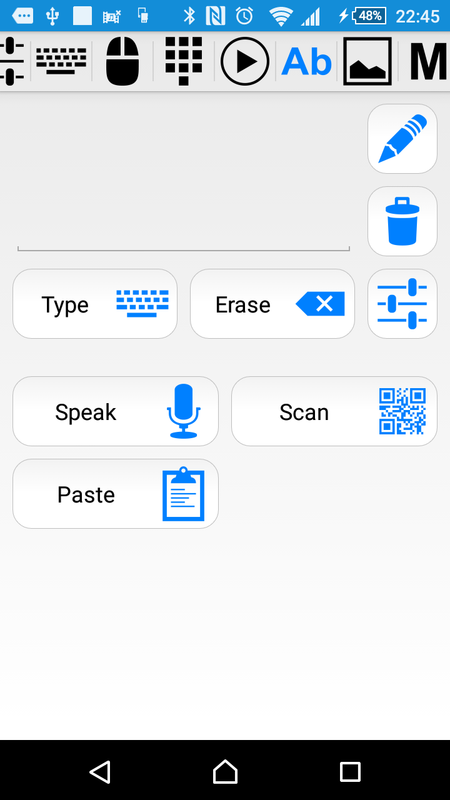 Due to changes in permission system introduced in latest release of Android OS (runtime permissions), it is now necessary for application to have LOCATION permission to perform Bluetooth scanning. You will be asked to grant the permission before scanning for new Bluetooth device. LOCATION permission is required ONLY to make the app compatible with latest Android version. Nothing else is changed. Your location is never retrieved by the app. Note: if necessary, it is possible to enter MAC address of InputStick device manually. In such case you must use other device to get the MAC address first. 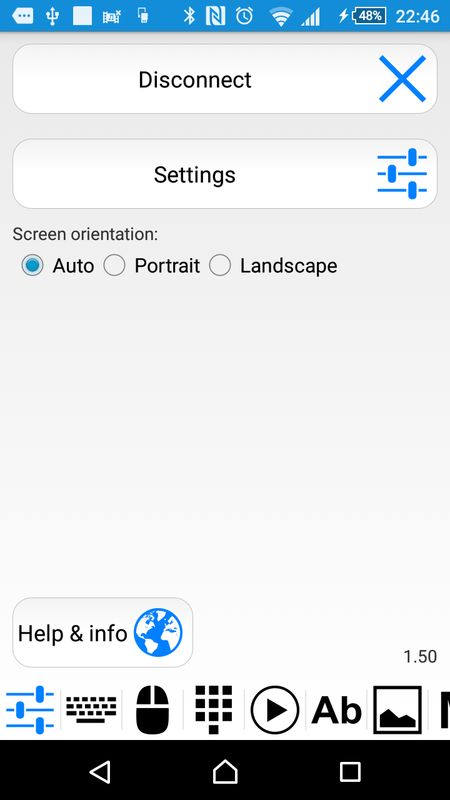 If for some reason default scanning mode does not work on your device, you can switch to new LE mode which was introduced in Android 5.0. Warning: Bluetooth 2.1 devices may not be discovered when LE mode is used! reboot device if everything else fails. 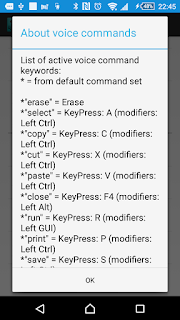 Keyboard interface does not work with OSX El Captain (10.11). Upcoming firmware update will solve this problem. 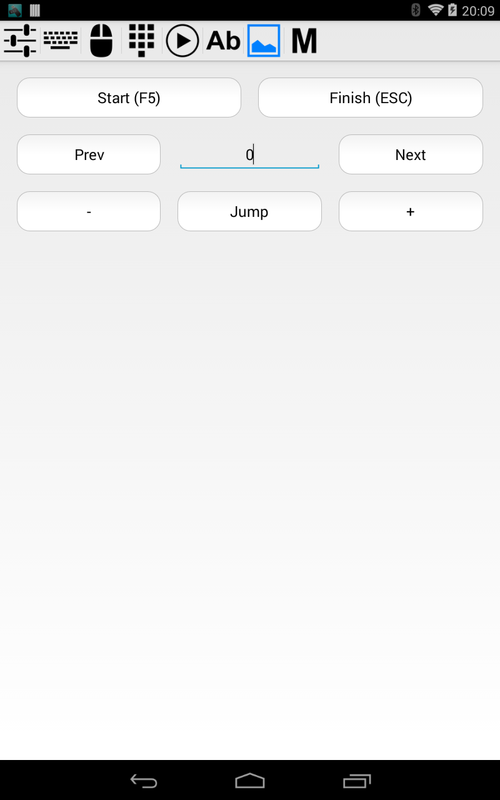 Here's a very simple app that I've recently made for a presentation. 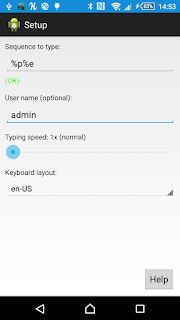 It allows to use Android smartphone and InputStick to perform brute force attack (via USB keyboard interface). This is just a simple demo application, not a real "hacking" tool. limiting physical access to USB ports. Please note that it is not necessary to install any kind of software on a targeted OS. In most cases, OS will simply recognize new USB keyboard and use generic USB HID drivers. It takes just a few seconds before first password can be typed. 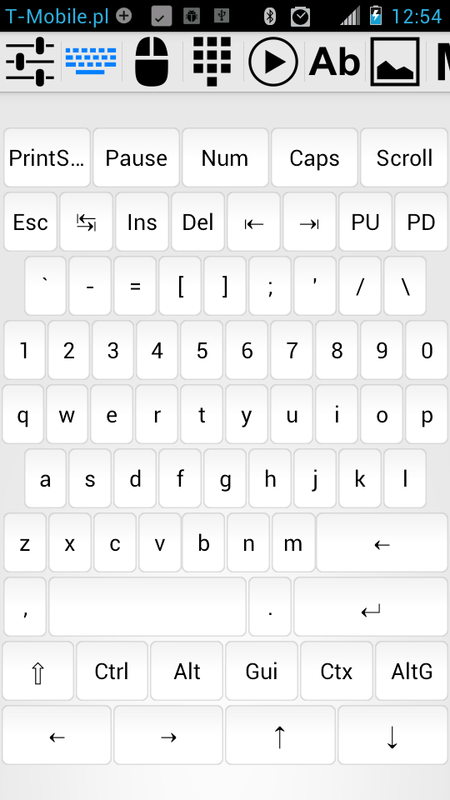 Also, even if new USB hardware is filtered, based on PID and VID, it is possible to change the numbers using InputStickUtility app, to match values used by currently connected USB keyboard. 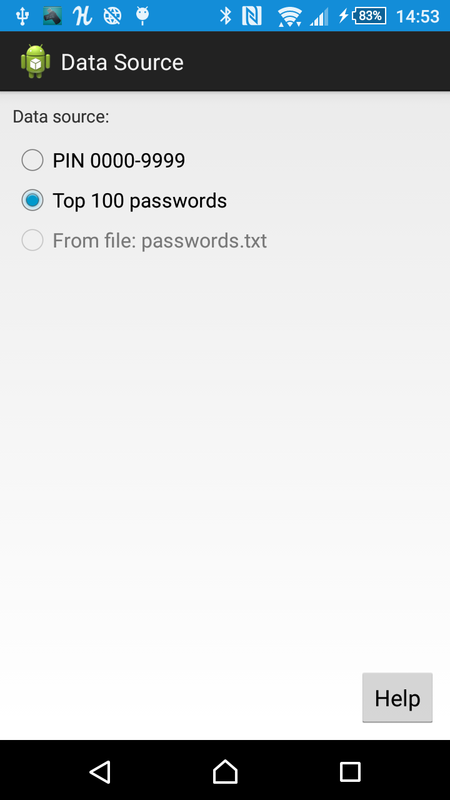 you can also prepare your own list of passwords and save them to //passwords.txt file. Note: it may be necessary to reboot OS if app is not detecting this file. %u%e%d%p%e - type user name, press Enter, wait 500ms, type password, press Enter. Now you are almost ready to go. Plug InputStick into USB port and hit "Connect" button. "Enter", "Tab", "Esc" - press Enter, Tab or Escape key. 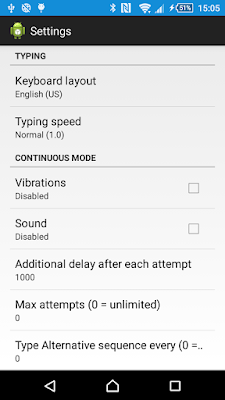 Modified "Add new device" screen (auto detecting Bluetooth type, advanced options). Fixed bugs causing application crashes. Application will display information whether BT4.0 is supported by this Android device. 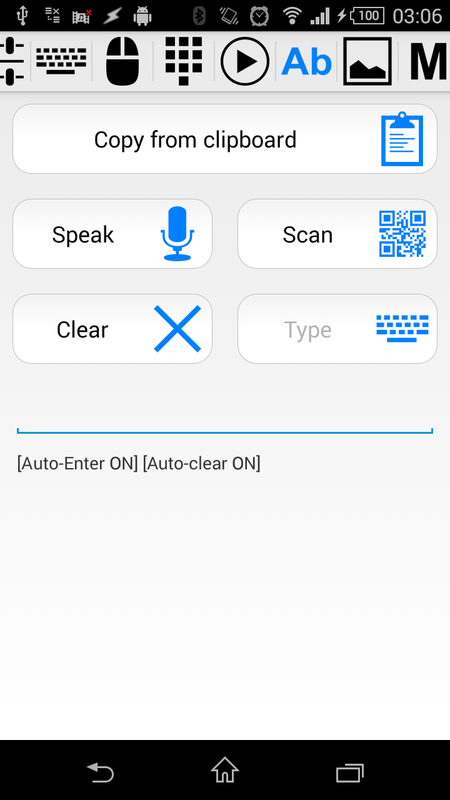 Bluetooth type is now automatically detected. 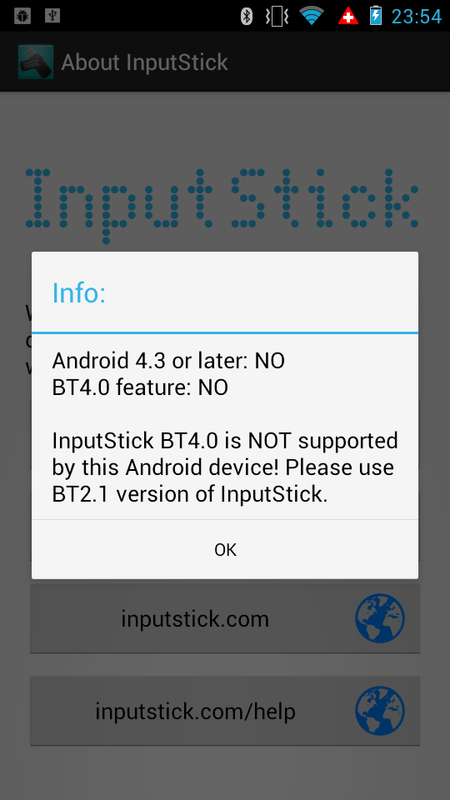 Devices without BT4.0 support will always assume that InputStick uses BT2.1 version. Behavior of "Refresh" button is now more intuitive. MAC address can be manually provided (for example when for some reason it is not being discovered by this device). 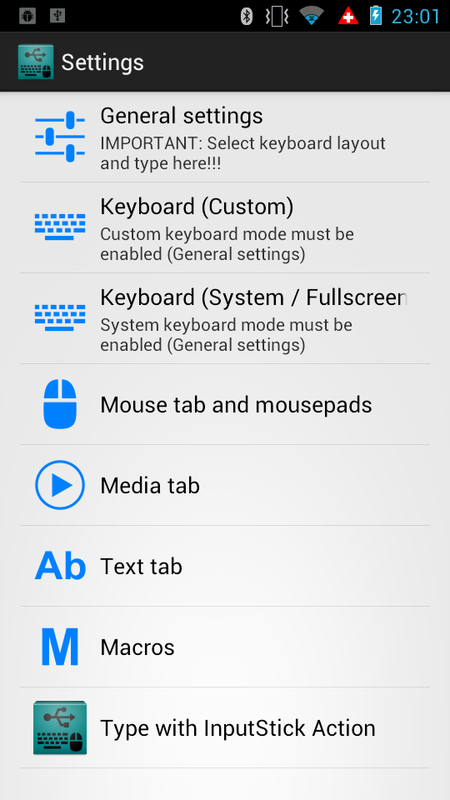 Bluetooth type can be manually selected (just in case if auto detection is not working properly). Device verification can be skipped, what allows to add InputStick device even if it's firmware is corrupted (if bootloader is still functional). 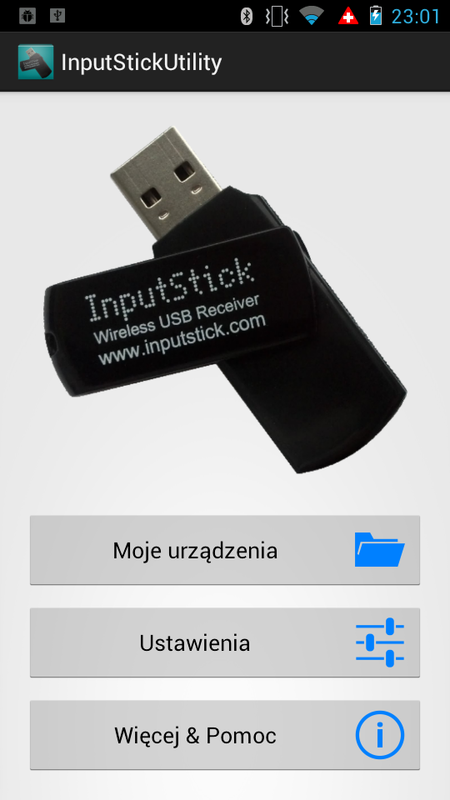 InputStick with Bluetooth 4.0 is now (finally) available, you can get it here: inputstick.com/buy. New version is a bit more expensive (+3 USD/EUR), due to higher price of BT4.0 modules. 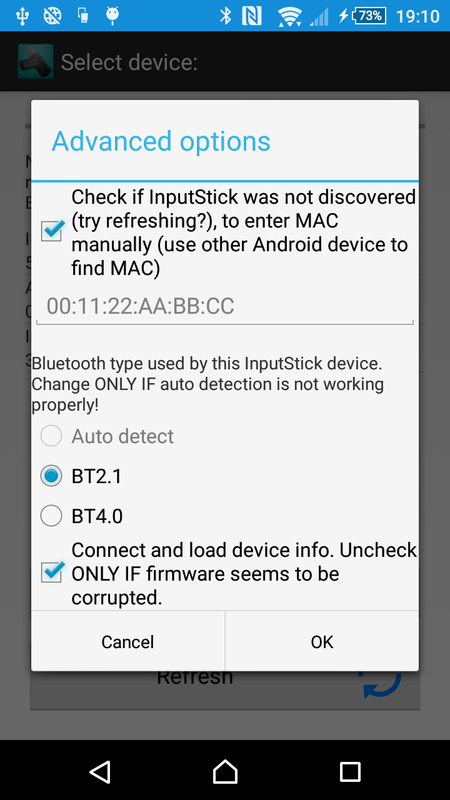 InputStick with BT2.1 will still be available and supported by all InputStick compatible Android applications. After all, there are still a lot of Android 4.0 and even 2.3 devices being used. 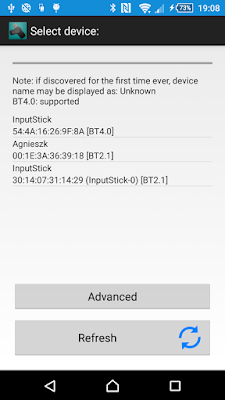 BT4.0 version is next step towards making InputStick available for iOS users (Android users can also benefit from using BT4.0). BT4.0 version is confirmed to work with iPhone 4S and newer. 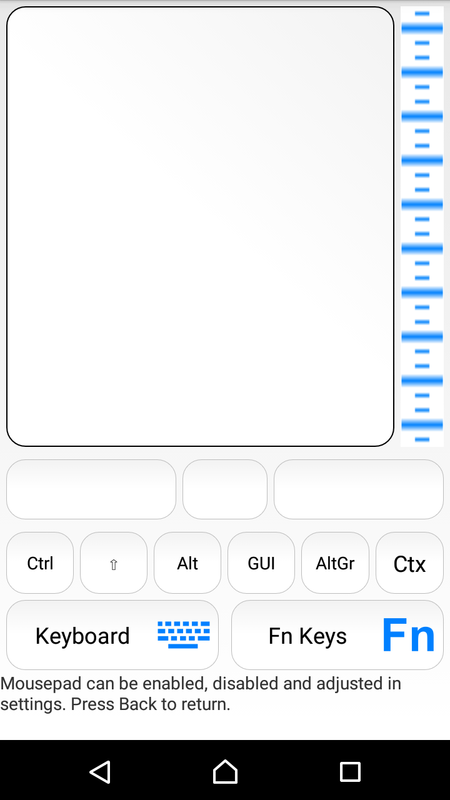 If you are an iOS developer, familiar with BT4.0, it should be relatively easy to use basic functions (like typing ASCII characters) using protocol documentation (available here). At this moment there are no iOS apps nor API available. 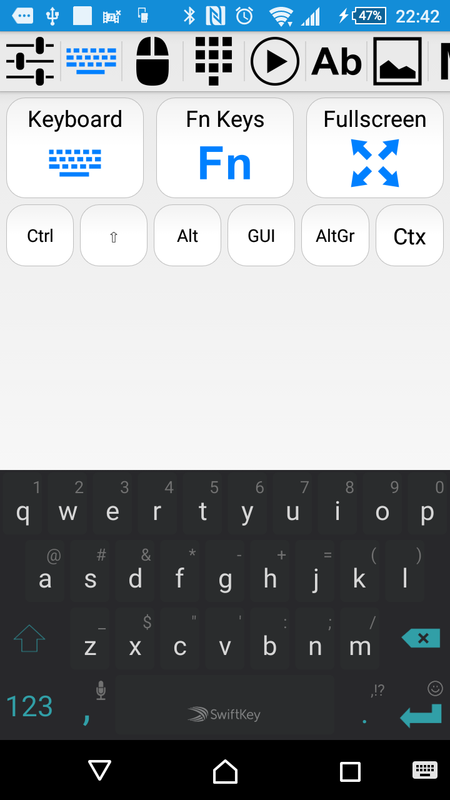 Basic functionality (typing ASCII characters) is relatively easy to implement, but full API will require much more effort: encryption and authentication, keyboard layouts, firmware upgrade, restoring defaults. Since I'm not familiar with iOS development, this task will be carried out by other developer. At this moment I still can't give any more details about when the API may be finally available. Why standard (BT2.1) version is not compatible with iOS devices? Apple decided that classic-Bluetooth devices must go through approval process and have special authentication chip. This is no longer the case when it comes to BT4.0, which was first introduced in iPhone 4S. The only difference between previous version and the new one is Bluetooth module. Other than that, hardware is exactly the same. Starting with 0.97 version, firmware supports both Bluetooth modules. This means that any firmware updates will be released for both BT2.1 and BT4.0 devices at the same time. All existing applications (that use InputStickUtility as a proxy), will work with BT4.0 version out of the box. Examples: USB Remote, KP2A plugin. 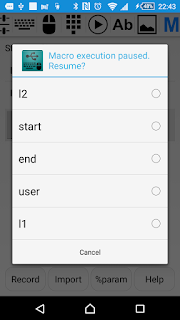 If you've developed your own app and decided to use direct connection method (instead of connecting via Utility app), it will be necessary to rebuild the app using latest InputStick API. 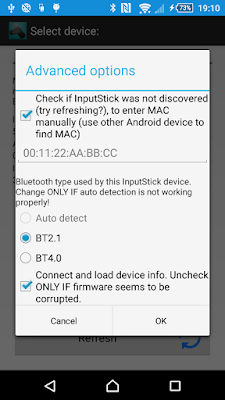 How to use BT4.0 InputStick with your Android device? When adding new device in InputStickUtility, check "This is a BT4.0 device" checkbox. 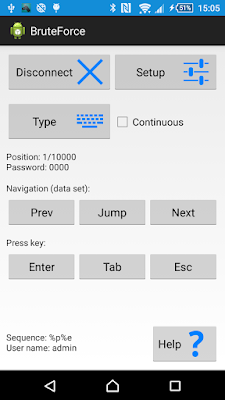 InputStickUtility app, version 1.30 or newer. How to check if your phone supports new InputStick? If your Android device was released within last 18 months, it is most likely compatible with new InputStick. 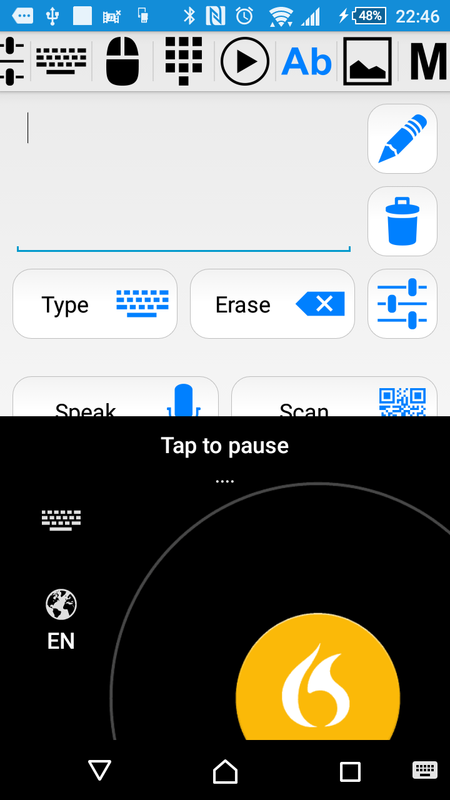 Bluetooth 4.0 vs Bluetooth 2.1.
faster connection establishment: BT4.0 takes less than a second to establish a connection and go through initialization. In case of BT2.1, this usually required approximately 2-3 seconds. lower latency: BT4.0 allowed to reduce latency, this makes noticeable difference when it comes to mouse interface, which now works smoother. lower data transfer rate: as a result, typing is approximately 25% slower. This becomes noticeable when a lot of text is being typed (more than 50 characters), for example when typing text files. 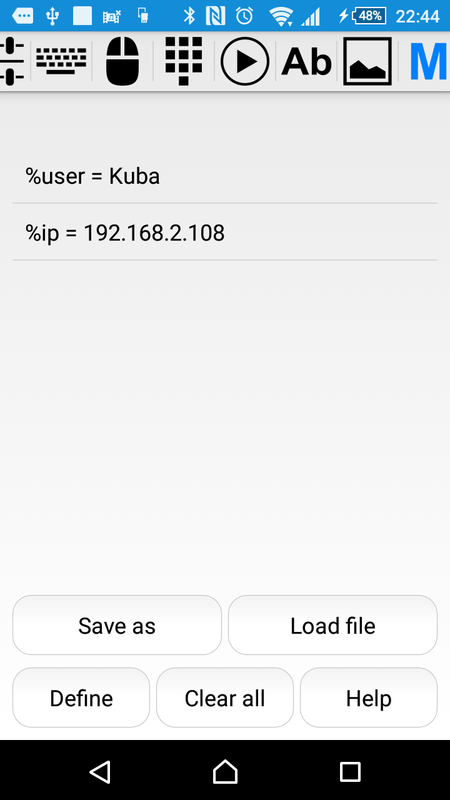 You most likely won't even notice this when using apps like KP2A plugin or USB Remote. 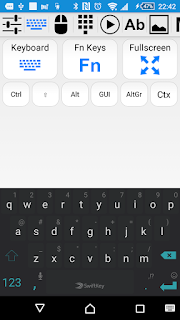 no pairing PIN: due to bug in Android OS, if BT4.0 device requires pairing PIN, the OS will ask for the PIN during EVERY SINGLE connection attempt. Because of that, by default there is no pairing PIN and changing PIN for BT4.0 devices is disabled in InputStickUtility. Note: InputStick can be password protected using 128bit key, so lack of pairing PIN does not make it less secure (compared to BT2.1 version). If someone connects to password-protected InputStick, he won't be able to use it in any way (send key or mouse events) unless correct password is provided. Also, firmware makes potential bruteforce attack less effective by limiting authentications attempts to one each second. In my opinion, in most scenarios advantages of BT4.0 are definitely more noticeable than its disadvantages. If you are mostly interested in using InputStick with iOS devices, you should wait a bit longer and wait for updates regarding iOS API and apps. Unless you are an iOS developer, familiar with using Bluetooth and want to try it ASAP. 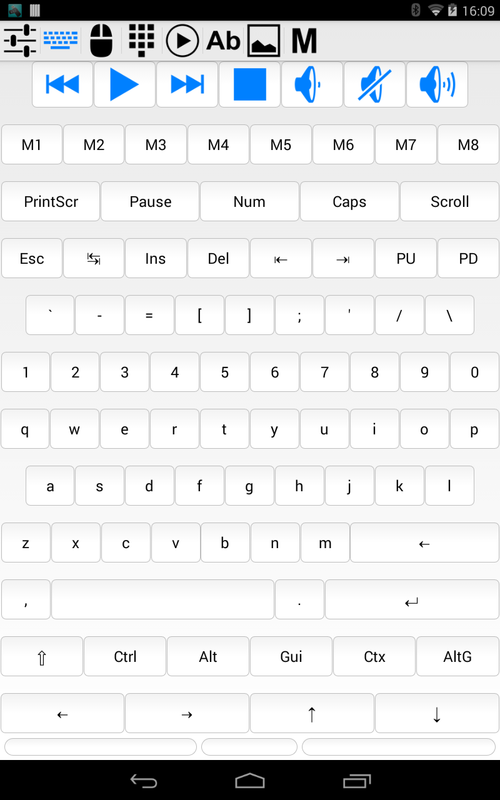 you are going to use InputStick to type A LOT OF TEXT (like thousand characters at a time) and typing speed is very important in your use case. In every other case, you should consider getting BT4.0 version. This update fixes a bug that appeared in previous version. When some other application was attempting to establish connection and InputStickUtility was not launched manually before, it would crash during the connection attempt. Support for BT4.0 can be checked (About & Help). 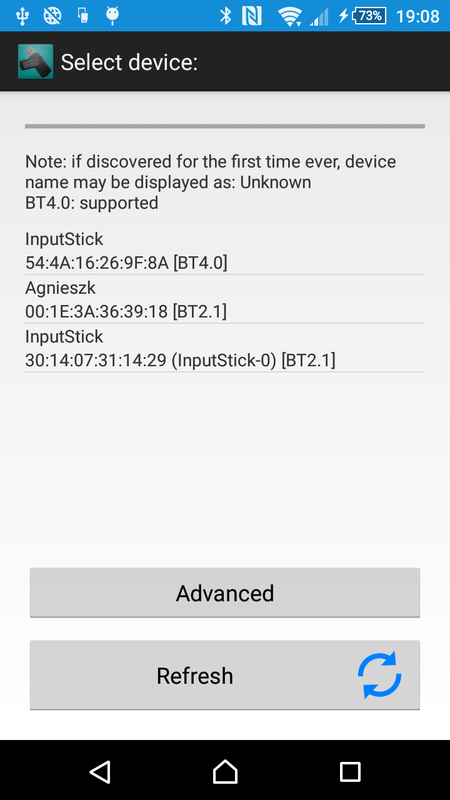 InputStickUtility can now be used to check if your Android device is compatible with upcoming BT4.0 version of InputStick. XT910 does not support BT4.0 InputStick. Polish translation won't matter for most users, but this is the first step to other language versions. minor bug fixes and UI modifications. Settings are now grouped into categories, that should make navigation a bit easier. Also, summaries are now properly displayed. Make sure that Settings -> Dialog settings -> Never ask (use default device) is selected. 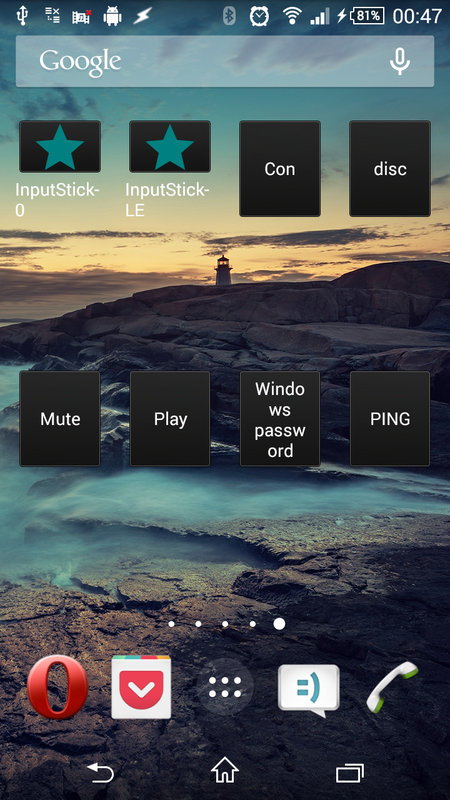 Use widgets to quickly set default device (for example: InputSitck-home, InputStick-work). 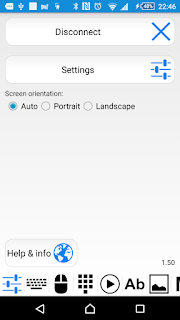 Widgets for setting default device. 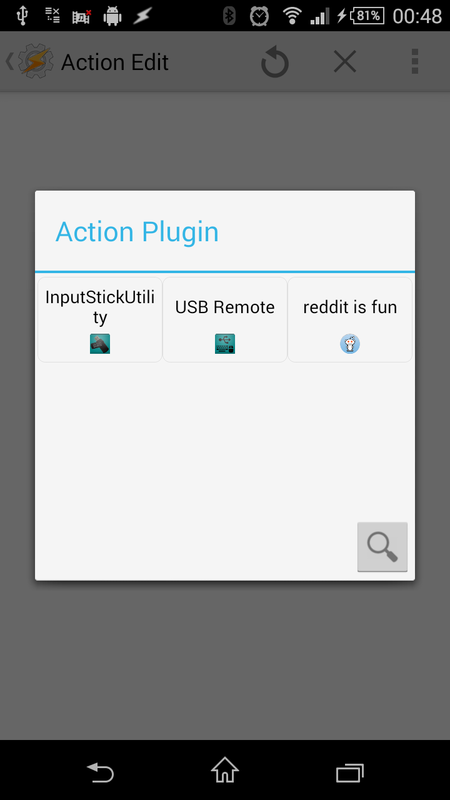 InputStickUtility is now detected by Tasker application as a plugin. 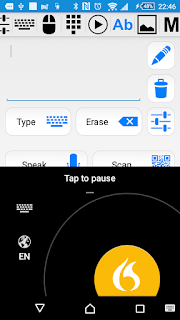 For more info about Tasker app, click here. 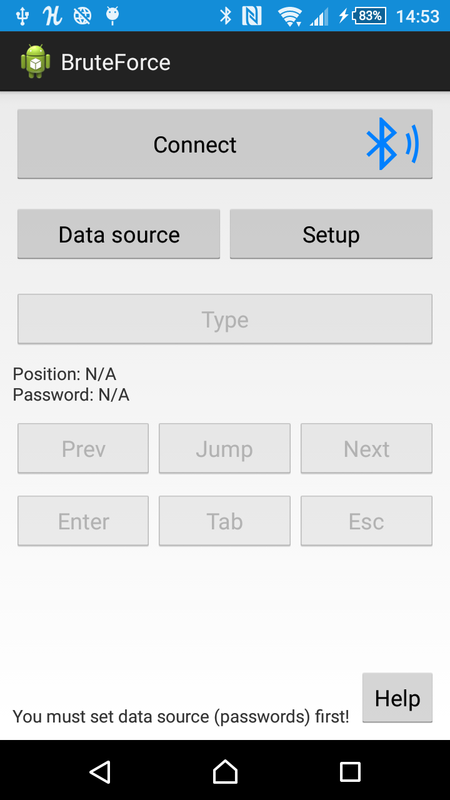 Tasker allows to automatize process of settings default device, based on time, your location, Bluetooth/WiFi devices available in range and other factors. USBRemote and InputStickUtility are detected as plugins. Bluetooth 4.0 is now supported. 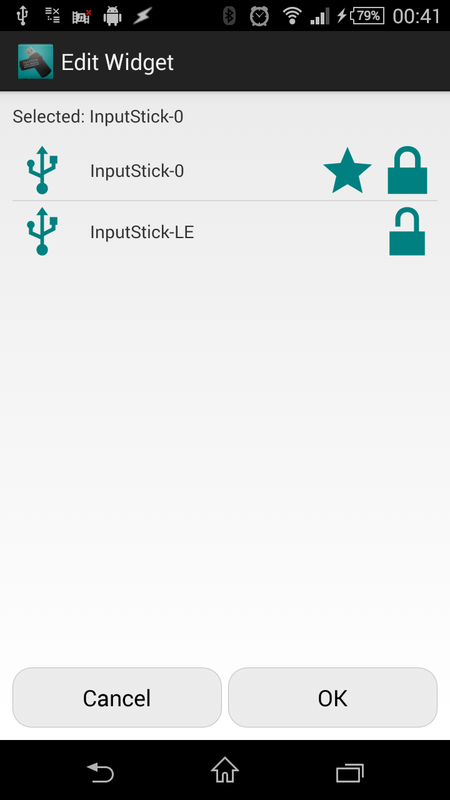 InputStickUtility is now ready for upcoming Bluetooth 4.0 version of InputStick. 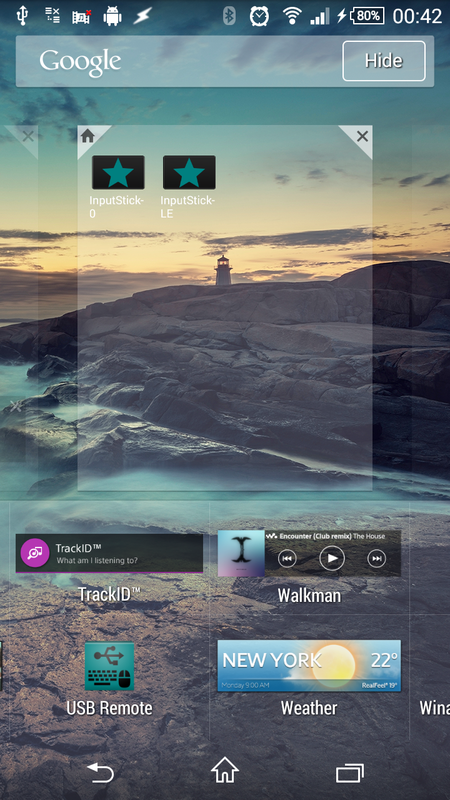 All existing InputStick compatible apps will work with BT4.0 version without any modifications. More info about BT4.0 version will be posted soon (probably next week, when I should receive first batch of BT4.0 devices from my manufacturer). Firmware upgrade screen will display notification if most recent FW is already flashed. 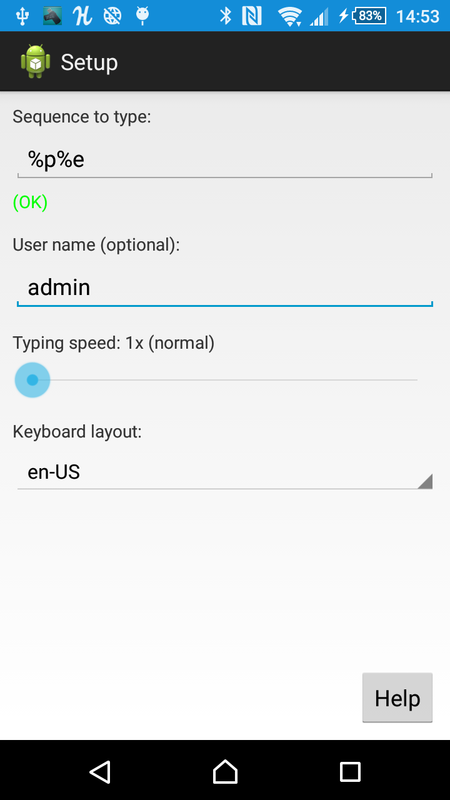 Automatically disconnects after settings new pairing PIN. "Connection state" - connect or disconnect can be selected. 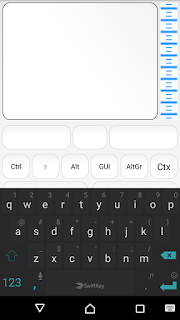 "Type text" - optionally can be followed with Enter key. "Run macro: - execute selected macro. "Media action" - volume down, volume up, mute/unmute, previous track, next track, play/pause. 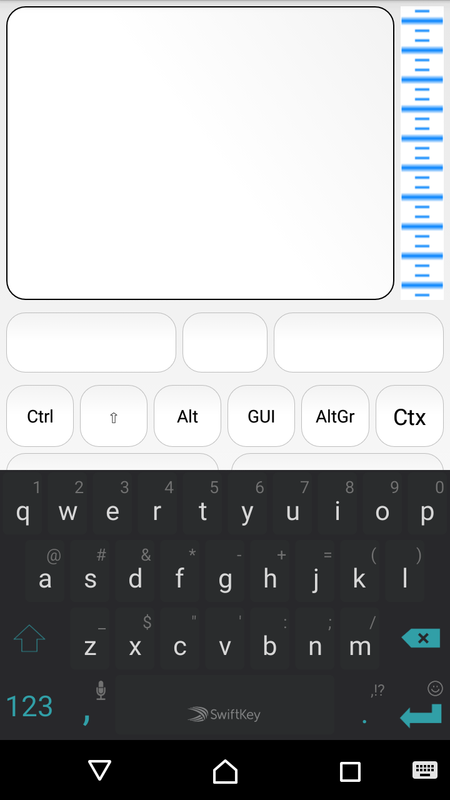 Note: if there is no active InputStick connection at the time when a widget is clicked, application will try to establish new connection. 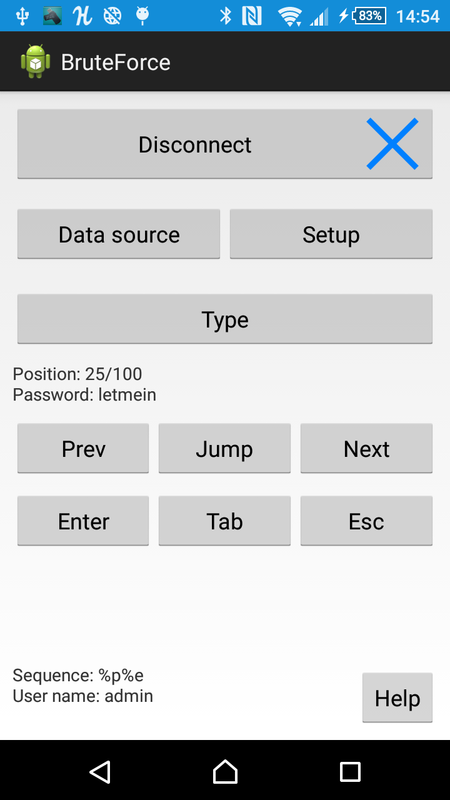 USBRemote is now detected by Tasker application as a plugin. 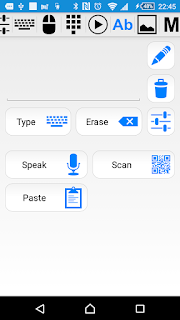 For more info about Tasker app, click here. 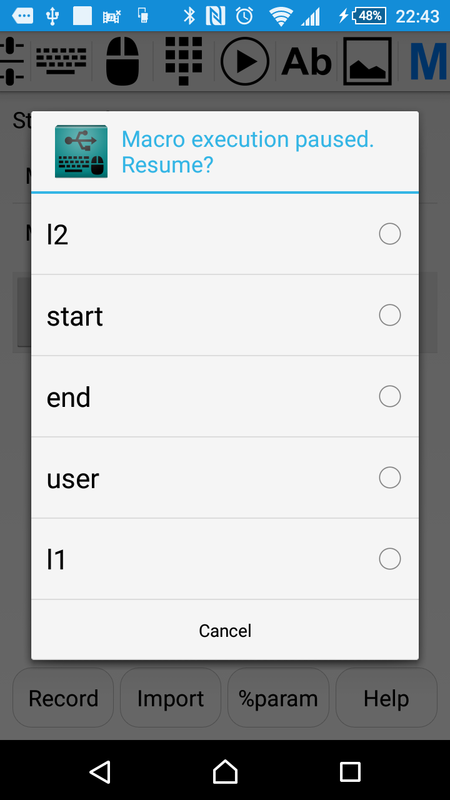 Select "InputStick-LE" as a default device. Type Windows password, followed by Enter. 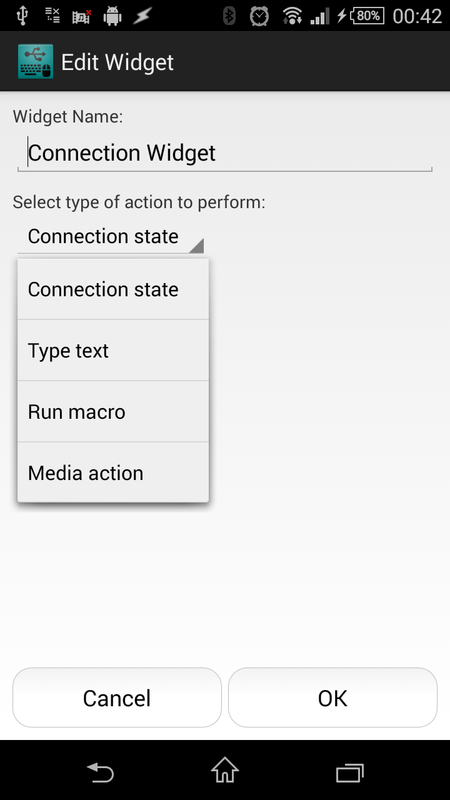 Connection will be triggered automatically, so there is no need to add "Connect" action. 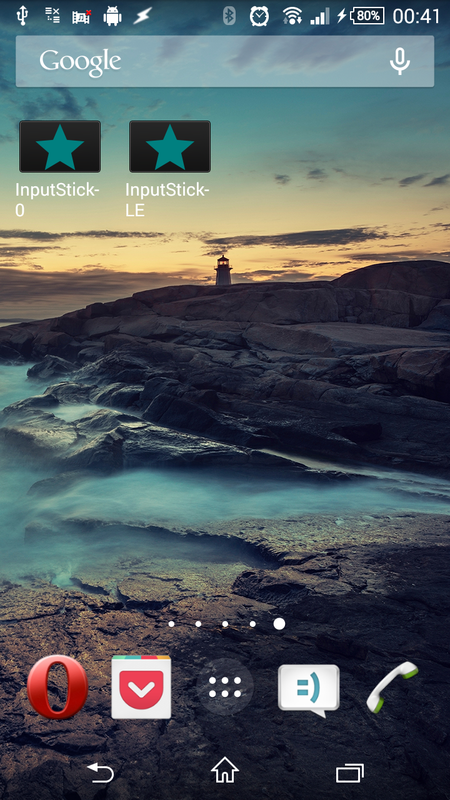 If InputStickUtility is set to connect to default InputStick device, without displaying popup dialog, everything will happen automatically without any interaction from user. Added separate screen for help URLs and opening changelog. Auto-clear option for text tab. This will come useful when typing a lot of text using "Text" tab. 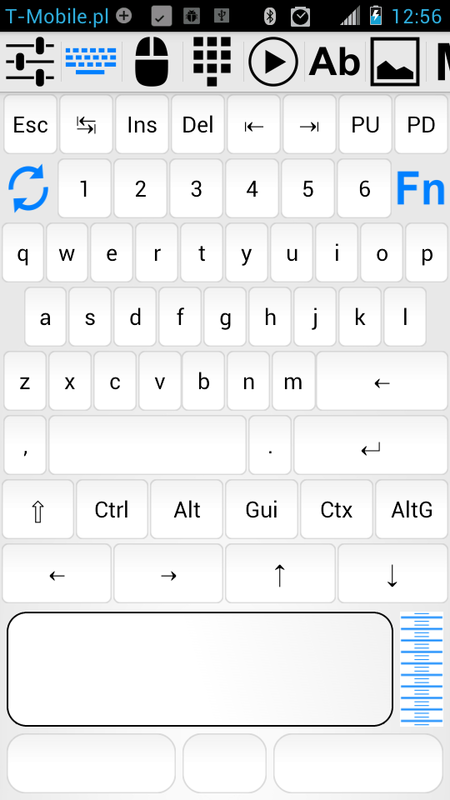 When "Type" button is pressed, text field is automatically cleared and you can immediately start entering new text to type. 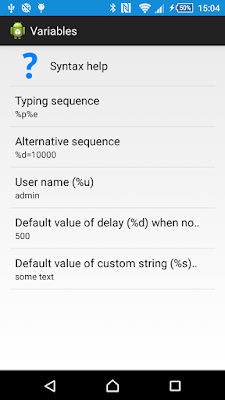 Automatically press Enter and clear text field after pressing "Type". 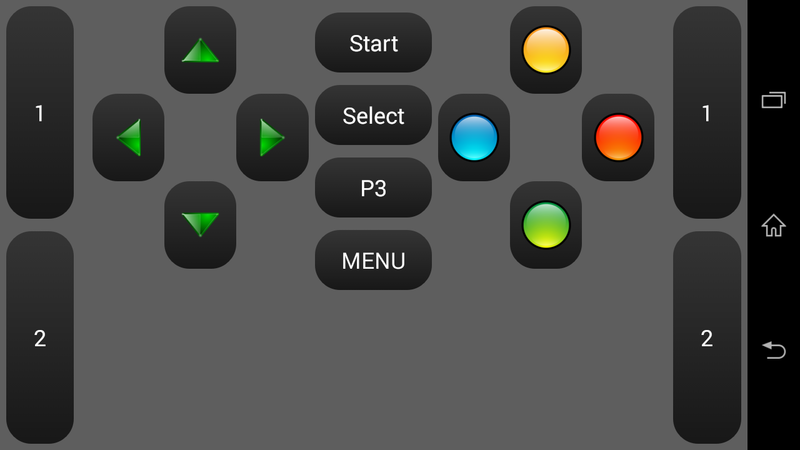 Now that gamepad is finally supported by latest InputStick firmware, I can continue working on gamepad app. 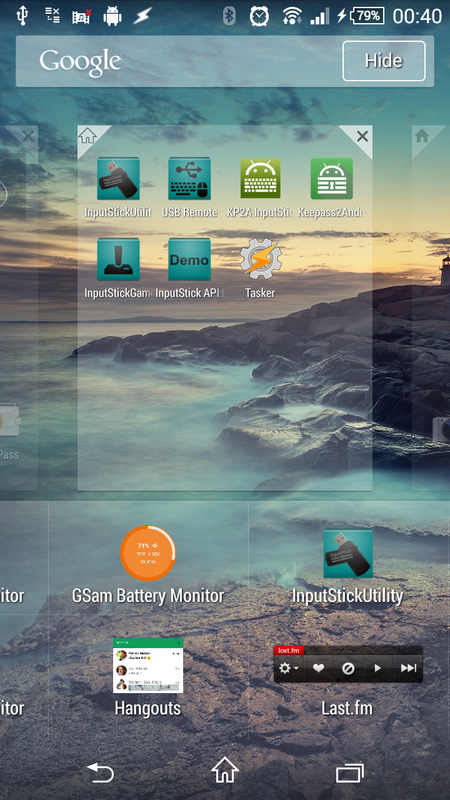 Download InputStickGamepad.apk (note: your InputStick must have latest firmware: v.097). 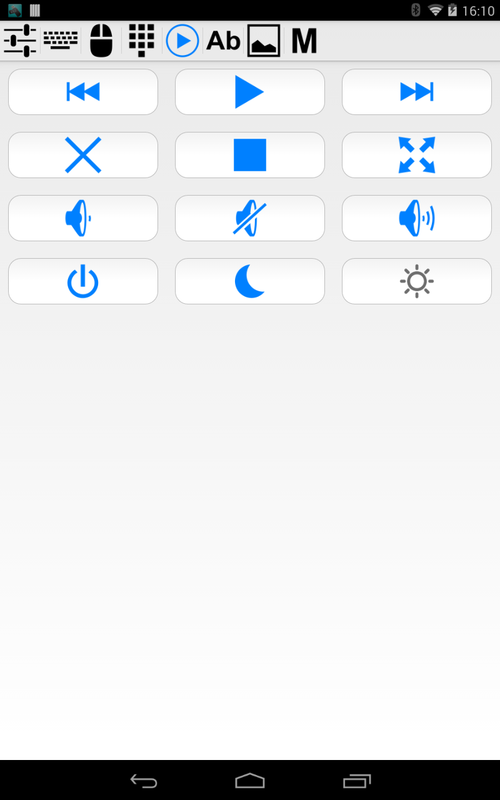 dead-zone can be set for accelerometer (useful when accelerometer is used for mouse or keyboard input). 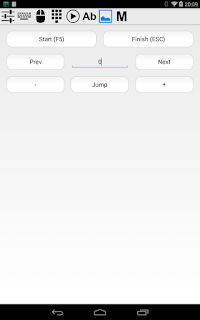 A lot of configuration and customization options are necessary before this app will be ready for Google Play store, so I guess it will appear in the store no earlier than March 2015.
m8.txt to assign it to M8 button. All macro files must be stores in /USBRemote/Macros/ directory. 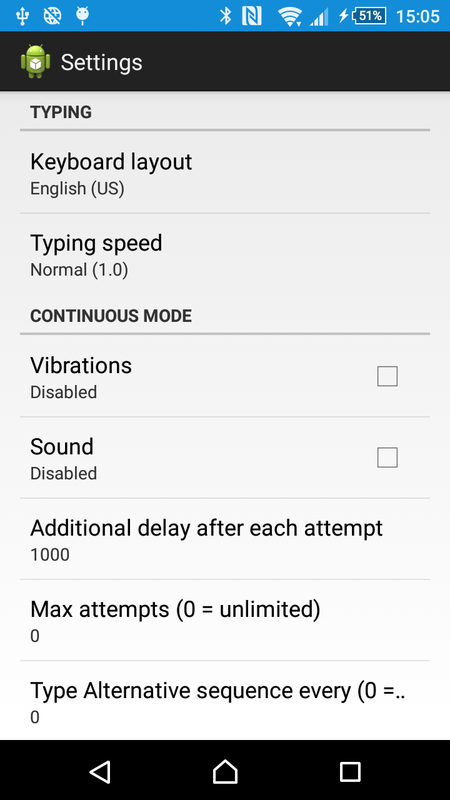 Settings -> Vibrate when key is pressed. Note: vibrations will not work with most tablet devices. Sleep, Power and USB host resume. OS allows this device to wake the computer. 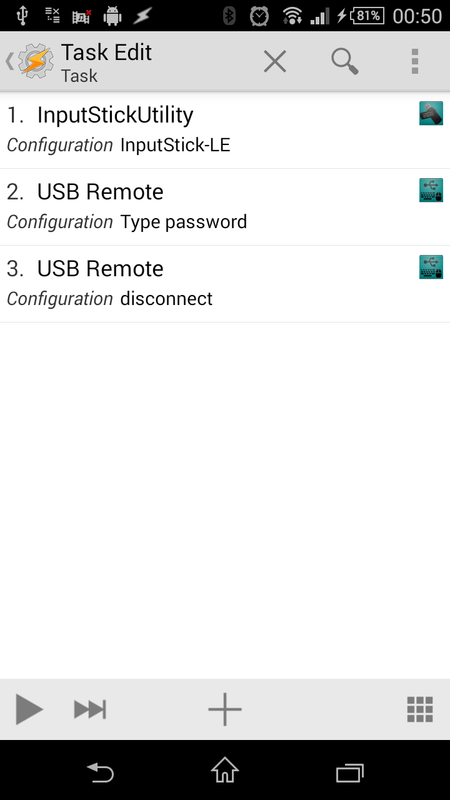 When auto-connect is enabled and user cancels "Select InputStick device" dialog, without selecting any device, USB Remote will no longer make another auto-connect attempt.